During my visit to this Museum, I came also to see the C-47’s that they had still operational in numbers, but entry to these planes was strictly forbidden, as if we came to spy for El Salvador a Hi Tech aircraft. Paranoia or not, the relations between the neighboring nations are still “awkward”, to say the least. 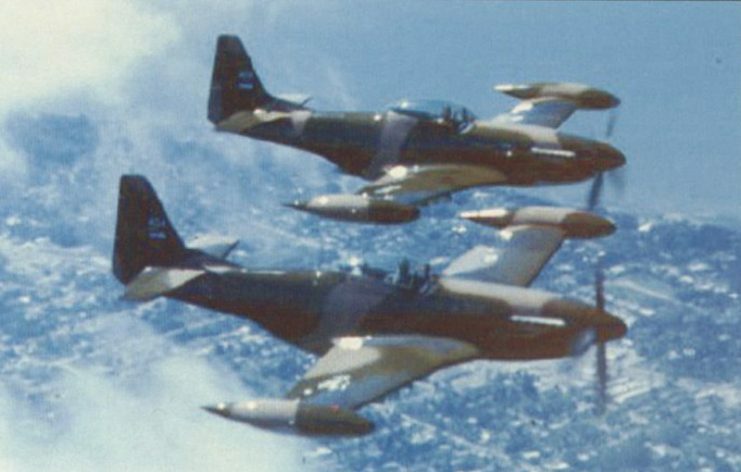 The Honduran Corsairs F-4U’s were the winners. Major Soto, Corsair nr. 609 is now a National Monument in their Aviation Museum at Toncontin AFB. Hence, both their Air Forces where not exactly equipped with the latest fads as Jet Fighters, Radar or early warning air space defense systems. Instead, they both flew with vintage WWII piston prop fighters and with a lack of bombers, they had converted their Dakota C-47 transports to makeshift Bombers, be it with a limited payload and accuracy. In 1967, El Salvador (and Indonesia) received from USA the Cavalier built Mustang II with structural improvements. The wing was strengthened to carry a total of 4,000 lbs of ordnance and additionally large wingtip tanks and weapon hard points were installed, along with a new Merlin V-1650-724 aero engine. These in Florida newly built Cavalier Mustangs also received a taller tail and in many of them a second seat for the observer/ passenger was mounted. The Salvadorian C-47 that opened the four-day war with Honduras (depicted) by flying a tricky solo bomb run over Toncontin airport in an attempt to destroy the enemy’s pursuit planes parked out in the open. This plane was never designed as a bomber and it was no wonder that their mission failed, considering that they had to roll the 100 pound bombs out by hand through a cargo door! “Once over their target, the Salvadorian pilots made a low pass over the undefended air base, saw all of the enemy’s fighters parked out in the open on the platform, and must have concluded that this was a once-in-a-lifetime chance to carry out an annihilating hit-and-run. It seemed almost too good to be true, and they probably found themselves dreaming of their arrival back in El Salvador to a thunderous ticker-tape reception as national heroes. However, although Dakotas are versatile and rugged planes, they were never designed for the role of bomber. On the second low pass, two crew members rolled a few bombs out by hand, over the threshold of the open gate-cargo doors that had already been removed. While the bombs flashed down under their enthusiastic shouts of “Geronimo,” they quickly found out that this was not the most accurate way of hitting a target. After two more passes and with all of their 6 bombs gone, they had merely hit the runway in spots here and there but had missed every fighter plane below! Those fighters were now being prepared for a counterattack, and as soon as the Salvadorians saw the pilots scrambling to their aircraft they decided it was about time to hightail it back home”. The Cavaliers that arrived from USA had to be converted to fighters in a couple of days only, under very primitive circumstances as you can see in this picture. There was a lack of parts and pilots, the FAS even hired 2 US pilots as mercenaries to train the local pilots in the aircraft handling and dog fighting. In the days that followed , it was the Salvadorian Army and Air Force that suffered most from the counter strikes of FAH. 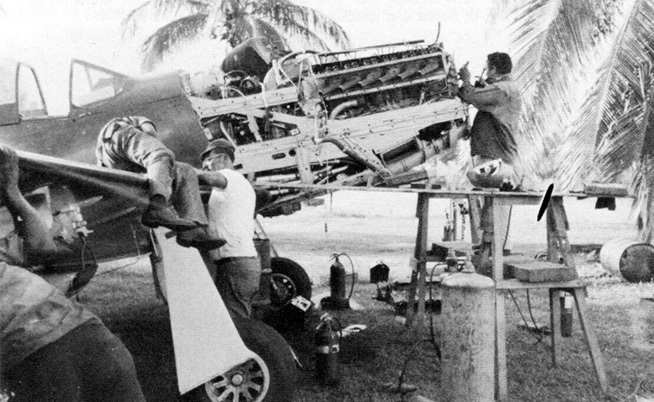 The Honduran Air Force also launched a bomb run on Ilopongo AFB with a C-47 later that same night , but with even worse results, no damage or even a bomb crater was ever found, while the pilots seriously claimed to have blown apart the Enemy HQ’s! 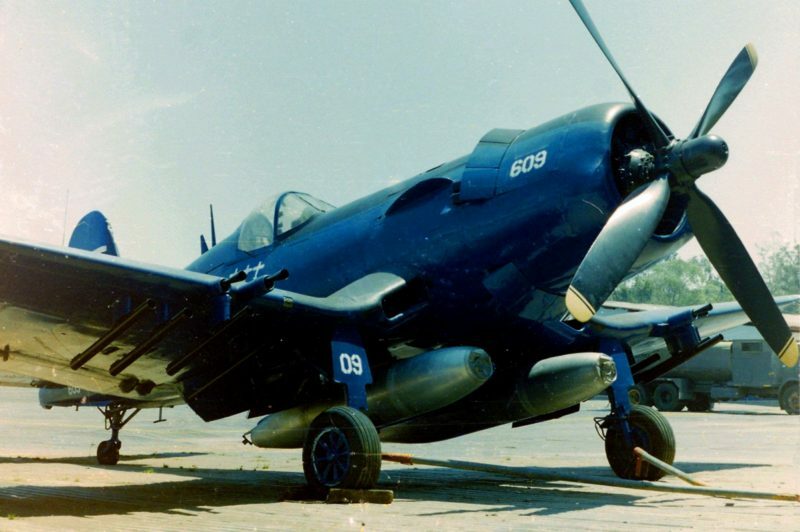 But the FAH Corsairs did better, they were able to knock out a larger part of the enemy fuel storage tanks on airport and sea port, and FAH Major Soto became the Ace of that war by shooting three FAS Fighters out of the air in less than the 100 hours that this war lasted. For more information about this war and my troubled visit to the Toncontin AFB, I refer to my book “The Dakota Hunter”. For a sneak preview inside, reviews and ordering, you’ll find more details below. Tribute to the P-51 MUSTANG. The genesis of the Cavalier Mustang II in the late 1960s was not even the end of the development of USAAF most successful WWII fighter. What you see here in the photo above is the very last of the line: The sleek Turbo Prop Cavalier Mustang III that was intended in a role as Close Air Support / Counter Insurgency Aircraft. Cavalier was sold and the ultimate Mustang came under the label of Piper as the PA-48 Enforcer. With a Rolls-Royce Dart 510 turboprop mounted in a Mustang II air frame, it had a radically increased performance and payload. Despite numerous sales pitches to the USAF neither the U.S. military nor any foreign operators purchased the Turbo Mustang III. Note the absence of the underbelly air scoop, no longer needed with the Turbo engine, the “fat” paddle blades of the propeller for better handling of the higher engine power, huge wingtip tanks for more range and what seems the removal/ photo shopping of the original marks on the vertical and horizontal tail with an N-registration barely visible. With the maiden flight of the North American Mustang on 26 October 1940 now 75 years ago, it is a tribute to the design of this beauty that could fly as an operational fighter/ interceptor for so many more years after WWII , quite probably one of the longest surviving piston powered fighters in military service. While the aircraft started its initial career (for the RAF) even before the USA entered WWII, the very last P-51 D’s flew in the service of the Dominican Air Force operational until 1984! Bravo for this icon of US Craftsmanship and Technology, the plane that I loved most as a young kid (next to the Dakota/DC-3/C-47). I must have built dozens of models of both aircraft, the Mustang even as a large RC model when I was 13-14 years old. I crashed it beyond repair on its maiden flight, but my love never faded for this legendary P-51. I designed this pennant for the 75 years celebration of its Maiden Flight and have it on my wall as a souvenir, reminding me of the crashed RC model which cost me a year to built but only a minute to break! The 2 feet long pennant is for sale in my web shop. For more information about my book The Dakota Hunter, please come to dc3dakotahunter.com where you can have a sneak preview into the 250 unique photos of my book. Read the very positive reviews at Amazon, Order and Review of the Dakota Hunter! The travel experiences of more than 20 expeditions all over the Globe have been condensed in 320 pages, the book reads like an adventure film. In search for the last and lost DC-3/ C-47 whereby I also have odd encounters with many other vintage aircraft, that survived in this world.